While establishing sensory storytime programming for children with special needs and their families from 2008-2010 in my previous position at Charlotte Mecklenburg Library, we became aware of a service gap for developmentally older children. 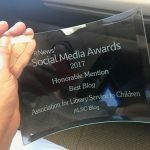 Purposefully, we did not set an age limit for the storytime and as a result, we served children aged 18 months through 22 within a program that was structured for preschool through early elementary-aged participants. It was our hope that the storytime offered something for everyone who attended through social, physical and literacy activities–yet occasionally during the social time following the program a parent would express interest in an experience of a higher or more challenging level. We compiled a list of contact information for families who would be interested in this programming when time allowed for it to be planned, yet time primarily allowed for the focus on the storytime programs being established through other locations in the system. Fast forward to Fall 2011 when pilot sensory programming at Cuyahoga County Public Library was being considered. Based upon my past experience, it was a priority to pilot both sensory storytime and sensory school-age programs simultaneously. Our first sensory school-age program scheduled at Maple Heights Branch of Cuyahoga County Public Library in January 2012 centered on a “Exploration Station Plus” kit with the topic of Construction. I adapted the kit for use with special needs audiences by inclusion of a visual schedule. Exploration Stations are programs in a box intended for library programming staff use in leading both children and their adult caregiver in hands-on activities examining science, mathematics, language arts and other aspects of a selected subject. The kits include materials and ideas for “stations” that are set up around the room in the style of children’s museum hands-on displays. The schedule for the first program displayed Boardmaker picture cards posted vertically on the board at the front of the class as typical of the sensory storytime class. When an activity was completed, I removed the corresponding card and placed it in an envelope on the flannel board with the word “DONE” written on it. After welcoming participants to the program, they are invited to sit on the storytime rug to await the start of the event. A bean bag song is included to encourage movement, communication and social interaction. The books selected for the construction-themed program were Those Building Men by Angela Johnson and The Three Little Pigs: an Architectural Tale by Steven Guarnaccia. 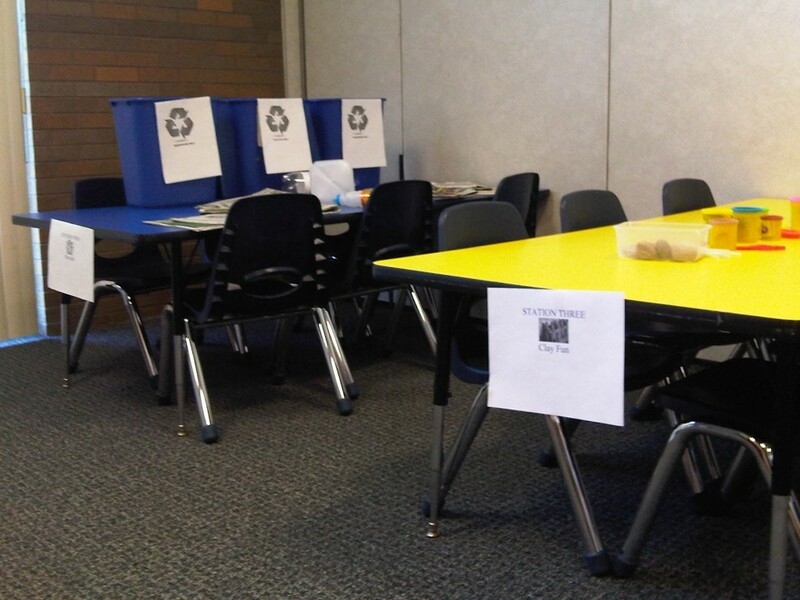 I pieced together stations based upon materials on hand at the branch, combined with other items included in the preschool-appropriate kit, as the “plus” materials to adapt the kit bookable from our Youth Services Department. The first station was called “Building Bridges”. It was simple to replicate because it consisted of 2 stacks of books (branch provided), 50 sheets of paper (branch provided) and 200 pennies (that were to be in the kit). I gathered easily the 2 stacks of books, 100 pennies by gathering loose change scattered throughout the branch and then halved the amount of paper to 25 to offset the difference. Additional tables were set up using the materials included in the kit supplied including building blocks, magnetic cars, and waffle blocks. I also set up a reading station displaying books ranging from pyramids to skyscrapers as well as other construction-related topics. 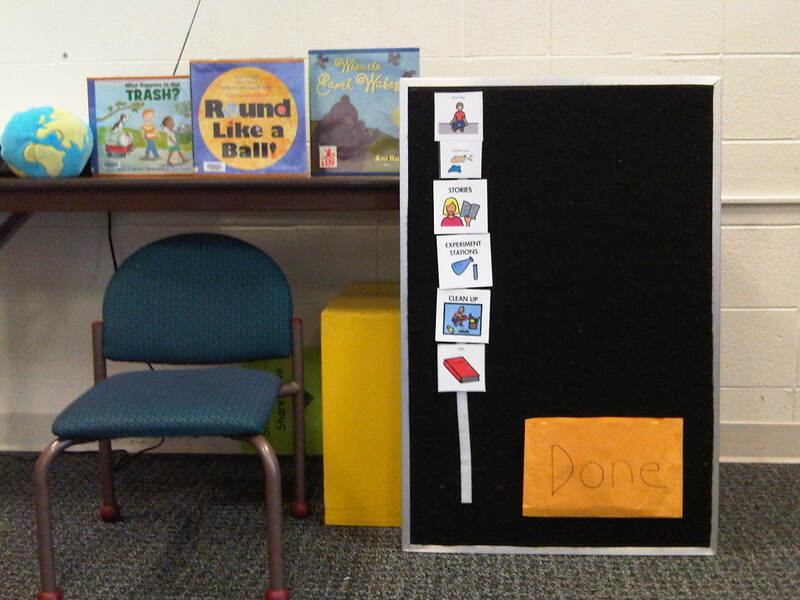 This step was included to encourage the transition from experiment time to final activity so that the group would be drawn back to the storytime rug for the final book. I selected Wave Goodbye by Rob Reid because of my past success using this title with all ages of sensory programming participants. Because it is a movement book, it draws the group back together and offers a fun physical activity to close the program. Also, this is a bridge activity for children who begin attending the storytime program and eventually move up to the school-age program. While we had five families registered, one attended–a family consisting of a boy aged six and his father and mother. This turnout was not discouraging because the weather was unfavorable and it was our first scheduled school-age program with a soft promotional push. Sensory programming is not about the numbers so much as providing a welcoming and inclusive experience for our underserved library customers. When the child entered the room, he made a beeline for the magnetic cars because of his interest in vehicles. Flexibility and respect for our families is vital for successful sensory programming. I spoke with the parents about how they preferred to proceed when it became clear that they were the only participants–explaining that based upon their needs I could adhere to the schedule as planned or they could more casually encourage their son to explore the various stations based at his own pace. When they opted for the latter, I provided a brief overview of each table’s station/materials so they would be aware of what was available in the room. I remained accessible to them, building blocks at one station for awhile, then perusing books at the reading station. The family stayed for over an hour during which they had the opportunity to “play” together, which they appreciated. At first their son was saying “good-bye” because as mom explained, this felt like a school situation where he was willing to remain without them present. Eventually, he stopped saying “good-bye” and realized that they were all participating together. As a result, the family had a unique, fun experience during which they stretched their son’s social and communication skills. By the mother’s own explanation, they do not often have opportunities to enjoy playing together as this program offered. One thing that she was seeking for her son was social opportunities for her son with other children and families. I encouraged her to not be disheartened that they were the only family at the first program. Two additional school-age programs have been offered since this first pilot session using the same schedule with substitution only of books/stations content based upon the change of theme. The second program centered upon a dinosaur theme. Stations included floor puzzles, dinosaur crayon rubbings and dinosaur figures of different shapes, colors and sizes. The third, most recent program was themed around “Earth”. I compiled the materials on my own rather than booking a kit from the Youth Department researching lesson plans and experiments related to the topic. A couple of the stations are shown below. One was a recycle station that I created by acquiring clean plastic, newspaper and cardboard. Each recycle bin had a specific item listed on the side and the children could sort out the materials where they belonged. Another station was a play dough station where the families could create earth structures–a globe, a mountain or anything that they were inspired to create. Both programs also had a reading table station with titles related to the theme. Beyond the scheduling of additional Exploration Station-type programs, I am planning other types of experiences for upcoming school-age sensory programming. Some of these sessions will incorporate the use of our TouchLab technology to share a variety of well-reviewed apps on iPads and iTouch devices that are sensory-friendly. Other ideas that we are considering are Robotix, building block programming and gaming. 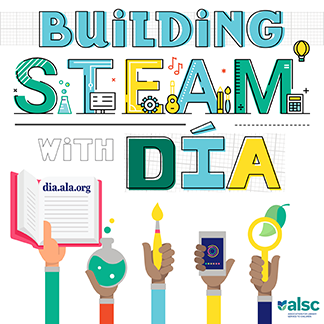 What are other libraries doing around the country specific to school-age level programming for individuals with special needs or disabilities? Our guest blogger today is Tricia Bohanon Twarogowski. Tricia is the Youth Services Supervisor at the Maple Heights Branch of Cuyahoga County Public Library. What a wonderful idea. I use visual schedules in my speech room for several of my students and we have them in classrooms where they are needed – how great to see them used in a library program! Tricia, your ideas are constantly inspiring and brilliant–this blog post is no exception! After the success of our Sensory Storytimes, parents were eager to ask–well, what’s next for our child who aged out of your program? These ideas are wonderful for that audience, and so necessary for all of our communities. Thank you for sharing them with all of us. I continue to learn so much from you! Thank you. It has been wonderful to see how many libraries across the country are now offering sensory programming—especially the storytime programs. 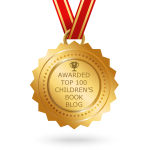 I hope that many who are finding success with the storytimes will be encouraged to try school-age programming as well!